Red dot is approx. 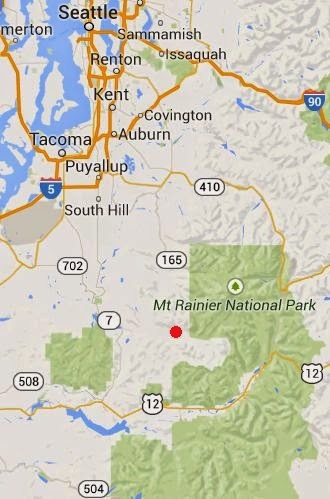 location of Bigfoot sighting. The latest Bigfoot sighting in the BFRO database comes out of Washington state. It took place just outside of Ashford, Washington on March 2, 2014. It was a class A Bigfoot sighting that occurred in Pierce County, which has 69 documented sightings according to the BFRO. 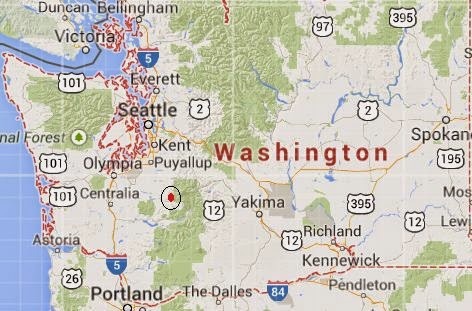 That is the most of any county in Washington. 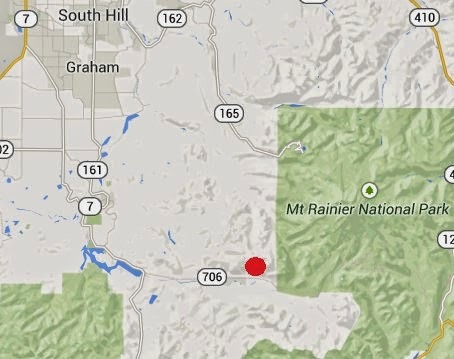 And I can see why, as it butts up to Mt Ranier National Park which is a vast area of wilderness. OBSERVED: I was traveling up copper creek near Ashford Washington in my off roader doing a snow run to test out my new knuckle I put in. It was about 4pm and as I was turning a corner, I saw a large hairy biped creature cross in front of me and go up the bank to my right. I stopped and watched for a moment before it had disappeared into the forest. I kept an eye out the rest of the trip, but didn't see anything else. While parked at the top, I heard distinct wood knocks. They sounded less than a mile off, but sound can carry well in the mountains. This event took place on March 1st approximately 4 PM. The witness was testing a repair to his off road vehicle. There was a lot of snow there, so it was slow going. He drove up Copper Creek Road about 4 miles, and when he came around a corner and saw what he described as an oversized gorilla cross the road and go up a hill to his right. He said that it walked through 3-4 feet of snow like it was effortless. He watched it as it disappeared into the forest. The witness described the creature as having rusty-brown hair. The hair on the arms was long at the elbows. The hair on the back and shoulders was also long. He said that the hair at the top of the head was pointed. It was estimated to be 8 ½ - 9 feet tall. It walked with a loping gait, which I interpret as long strides. He said that it never turned to look at him, and it just kept on going. Pictures of its footprints in the snow? ive had some things happen to me on copper creek road and i have put them on the BFRO website and no one ever got back to me. in aug me and my father and a army buddy are going back to do a week long trip in the bush. It has been many many years ago Easter of 74 ... East of Port Angeles out on Irving Jacobs road ... I was playing with a friend on our hay wagon and we heard this scream ... I was probay 10 years old the only sound I could compair it to was a primeate. It was very close and very loud it scared us we ran inside the house and told my parents about it ... My dad and oldest sister got in the pickup and drove yo the back of the property but found no tracks ... At that time it was still very wooded. I know it wasnt a big cat a dogbor a bear. It was a Bigfoot. I was recently at a bed n breakfast in Ashford. Every time I went outside for a smoke at night, I had a very eerie feeling from the surrounding pitch black woods. The property was very big and no close houses. I just had a feeling there was something watching me from not too far. I don't get that feeling in the woods where I live. Maybe Ole Biggie was within a hundred feet of that house.